Artist rendering of bike path and Alto tunnel entrance. 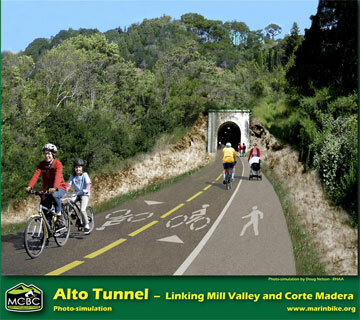 I didn’t know about the Alto Tunnel until yesterday, and now I’m hoping, along with thousands of other bicyclists, to see it re-opened as part of a bike path plan between Mill Valley and Corte Madera. The Marin County Bicycle Coalition is doing everything it can to convince government officials it’s the right thing to do. They have an uphill battle because a recent $225,000 study gave a lukewarm assessment, focusing on the cost of re-opening. I can think of many highway projects that don’t make economic sense, but somehow they get funded. The 0.33 mile tunnel was built in 1884 as part of the North Pacific Coast Railway, which changed name once again before ending as the Northern Pacific Railway. The loss of railroads is another tragedy, but we can only deal with one tragedy at a time here. Alternatives to the tunnel route are much less desirable. The one alternate route (Mill Valley – Corte Madera) I’ve ridden is Camino Alto/Corte Madera Ave. By a stroke of luck, the road was closed for pipe repairs last spring, so I had the road to myself. Unfortunately, it’s a narrow, winding road and I can imagine motorists detest having bikes disrupt their commute. So they should be for the tunnel. If you’re interested, you can sign a petition online. This entry was posted on May 26, 2010 at 1:59 am and is filed under News. You can follow any responses to this entry through the RSS 2.0 feed. You can leave a response, or trackback from your own site.